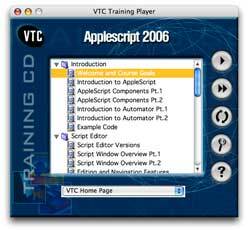 This is an introductory AppleScript training CD, available from the Virtual Training Company, for anyone interested in learning AppleScript for OS X. 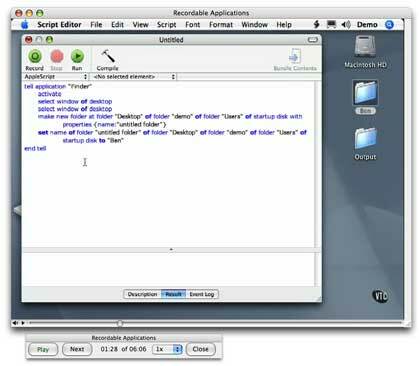 Well-known AppleScript columnist and author, Ben Waldie, president of Automated Workflows, LLC, has created 91 detailed lessons, totaling 7 hours of training, that provide users with a solid introduction and foundation for writing AppleScripts. Follow along at your own pace, and begin learning about the power of AppleScript automation. Below is a listing of the topics covered on the AppleScript 2006 Introduction to AppleScript Training CD. The first 21 lessons are available for a free preview. To view the Free Tutorials listed below, you must have QuickTime installed. Please note that the online free samples have been compressed for quicker downloads. Purchased CDs have higher sound and video quality. Monitor resolution needs to be set to at least 1024 by 768 to view the entire movie. The 2000 Mac OS 9 version of this Training Course is still available. To get it, click here. Visit VTC's website to view the first few chapters online for free. Order your training CD from VTC today! Join VTC's Online University to access this and other VTC training courses right away!